If you've never tried it before, these grilled black pudding starter recipes are the perfect introduction to this wonderful blood sausage. Some people here in the UK consider black pudding as a “Northern thing” others simply think it's something to have as part of the traditional full English breakfast and to a greater or lesser extent they're both right. In America it's generally referred to as boudin (the same as in French) or blood sausage. Whatever you call it, black pudding has however undergone something of a renaissance in recent years with many top chef's starting to include it on their menus. To be honest, for me, it never went away. 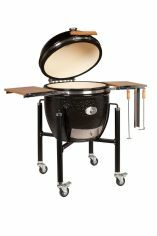 I love to use it either as an ingredient to bring out the flavors in another dish (great with smoked belly pork) or served in an uncomplicated manner as a starter, and grilled black pudding sure makes a perfect starter. Just add something sweet like a honey mustard dip or caramelized apple, you can also keep it simple and just top it off with some homemade ketchup. I've used the Spanish version (Morcilla) in this traditional dish called Cocido de Montaña and come up with one of the best baked beans recipes that I have ever tasted. When you buy sliced black pudding it's already cooked so technically you could eat it as it is but the true texture and flavor comes when you grill it just to darken the surface and crisp it up. 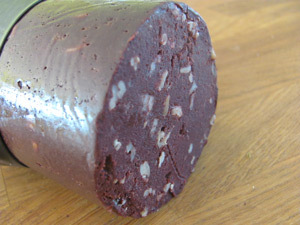 In addition the best black pudding is made with fresh pigs blood, it has a much creamier texture and is lighter in colour than black pudding that has been made using powdered blood. If you have a friendly abattoir near you, ask if they will give you a milk carton full of pigs blood and then follow my fresh blood black pudding recipe. In this instance I've used slices off a stick, slices should be about 1cm or ½ inch thick. Use a sharp knife to nick the skin around the circumference and remove it. After that it's just a matter of oiling your cooking grate to stop anything sticking (or use a teflon bbq mat) and grilling for 5-10 minutes on each side over hot coals. 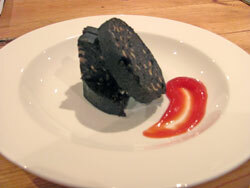 This is black pudding with my home made ketchup recipe – simple but effective. 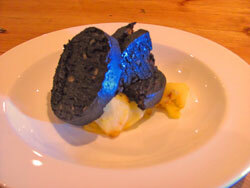 Below a great black pudding starter served on a bed of caramelized apple. To make the apple is really easy, just thinly slice the apple and pop it in a frying pan on a low heat with a knob of butter and a teaspoon of white sugar. The apple will wilt and sweat to produce a light syrup – lovely. If you fancy something more spicy then try these bites. 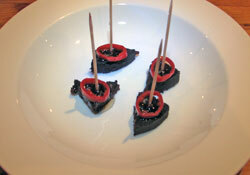 Cut up the grilled black pudding into cubes and insert a cocktail stick. Thread a ring of red chili onto the cocktail stick and drizzle the tip of a teaspoon of honey into the chili ring.